With more than 300 days of sunshine per year and roughly 365 days of waves, the Algarve is one of Europe’s most popular surfing destinations. It’s affordable, easy to get to from most of Europe, and has some of the most beautiful beaches in the world. If you’re looking for somewhere to learn to surf, or somewhere to practice surfing, there are few places in the world that are better. Know how to surf? Skip, the next bit and take a look at accommodation ideas, surf spots, and other information. Don’t know how to surf (or need to improve)? Read the next section about surf schools and lessons in the Algarve. If you don’t know how to surf, or you don’t know how to surf particularly well, the Algarve is a great place to learn. You’ll find plenty of surf schools here where you can either book a surfing holiday or, if you just want to give it a go, individual lessons. There are numerous surf camps on the Algarve, particularly around Lagos and towards the West Coast of the Algarve. Knowing which one to book with can be difficult, but, thankfully, there are a few sites that have reviews and listings for upcoming surf camps. Surfholidays.com – One of the largest surf holiday comparison websites with lots of reviews from other people. Booksurfcamps.com – A slightly smaller surf holiday comparison site, but it still has a few reviews for each school. If you’d prefer to learn to surf in a women only environment, the good news is that there are an increasing number of surf camps that are just for women. Not sure if surfing is right for you? You could book a trip to the Algarve and a couple of surf lessons (1-on-1 or group) to just give it a go. Then, if it’s right for you, you could always book more or come back another time for a proper surf bootcamp. Surfholidays.com allows you to book lessons (select Algarve) at many Algarve surf schools. There is just about every time of accommodation option on the Algarve for surfers including surf camps, surf hostels, campervans, apartments, villas, and just about everything else that you can think of. Endless Summer Surf House (Arrifana) – Located less than a 5-minute drive from Arrifana beach, this hostel offers both accommodation for surfers as well as both surf and yoga lessons. Good Feeling (Vila do Bispo) – Surf hostel near Vila do Bispo that provides free beach transfers for guests. Algarve Surf Hostel (Lagos) – Surf hostel with swimming pool that’s a part of Algarve Surf School and organises surf lessons and trips to nearby surfing spots. Mayla Surf House (Aljezur) – Located in Aljezur, around 15 minutes’ drive from the coast, Mayla Surf House offers hostel accommodation with a swimming pool. Vale Figueiras Surf Resort (Bordeira) – Situated in Monte Novo, around 20 minutes’ drive from Bordeira beach, Vale Figueiras Surf Resort offers simple hostel accommodation in the heart of the Algarve countryside. Hostel do Mar (Bordeira) – Surf hostel located next to Bordeira beach. International Surf School & Camp (Sagres) – Surf hostel in Sagres with shared guest facilities like a lounge and kitchen. Surf ‘N’ Sand Eco-hostel (Carrapateira) – Eco-lodge that’s located in Carrapateira and within easy access of Bordeira beach. Maria do Mar Surf Villa (Arrifana) – Villa with pool located near Aljezur and Arrifana that offers private rooms for surfers. Surfholidays.com allows you to book accommodation at surf camps, as well as hostels and villas. Russo Surf School – Accommodation at a surf camp in Vale Figueiras near Vale Figueiras beach and Bordeira beach. Many surfers stay in a campervan or motorhome, particularly during winter. This allows them to park pretty close to the beach (usually in a car park nearby) so that they can get up early and hit the waves as soon as possible. This isn’t the cheapest form of accommodation, but it saves renting a car and it’s also a lot of fun as well. Want to stay in something a little more unique? Here are a few more suggestions. Surf Truck Hotel – A “hotel” on wheels that makes surf trips up and down Portugal’s West Coast, stopping at surf spots along the way. Tipi Valley – Stay in a tipi, either shared of private. Memmo Baleeira – If hostels and campervans aren’t for you, why not stay in a boutique hotel instead? Memmo Baleeira offers surf lessons and is also located close to several surfing spots, if you just want to do your own thing. There are surf spots all over the Algarve, and they can be broken up into three areas: near Sagres, the Costa Vicentina (or Parque Natural do Sudoeste Alentejano e Costa Vicentina to give it its full name), and the Southern Coast. The waves on the Southern Coast are usually quite small and most of the time are only suitable for beginners. But even though there are beginner waves in places like Praia da Rocha and Lagos, the vast majority of surfing, even beginner’s lessons, takes place along the West Coast. Tip: If you’re not staying with a surf school or at a surf hostel, use the Magic Seaweed app (iOS or Android) to get surf forecasts for each of the beaches around the Algarve. The Algarve’s airport, Faro Airport, is situated on the eastern side of the Algarve roughly 1 hour from Lagos and 1.5 hours from Sagres. Lisbon Airport is also not far from the Algarve: roughly 2.5 hours away if you take the toll roads or around 4 hours if you avoid them. A car is definitely an asset on the Algarve, and will allow you to get to the beaches easier. You may not need need this if you’re going to a surf school as they will have transportation to bring you to and from the beaches. Renting a car? Does it need a roof rack and straps (for your surfboard) as well? It can be very difficult to find a car hire company that also rents out roof racks which is why many surfers bring an inflatable roof rack with them. Alternatively, consider renting a car (or van) that’s big enough to take a surfboard. If you decide not to rent a car on the Algarve, you’ll need to find another way of getting to your accommodation. The train runs from Faro as far as Lagos, and after that you’ll need to get a bus or taxi if you’re going to Sagres or somewhere else along the West Coast. Buses also run between Faro or Lisbon and towns like Sagres, although it may involve at least one change. Alternatively, you could book a transfer with a company like Welcome Pickups or a shuttle bus transfer through hoppa.com. Most airlines allow you to bring your surfboard with you for a fee, although it might be worth taking out some form of travel insurance to cover it in case of damages. Surprisingly, the fees are usually pretty reasonable – especially when compared to the cost of renting a surfboard for a week. If you decide to rent a surfboard in the Algarve, there are plenty of surf shops especially in Lagos and Sagres. For new equipment, there are plenty of surf shops in Lagos and across the West Coast and there are also 2 Decathlon stores in the Algarve as well. It’s a good idea to consider taking out travel insurance, especially as you’ll be taking part in sports. As well as the medical cover, which is obviously the most important part, insurance is also important to protect your possessions (e.g. your surfboard, if you’re bringing one), cover you in the event of a missed flight, and to give you personal liability cover. 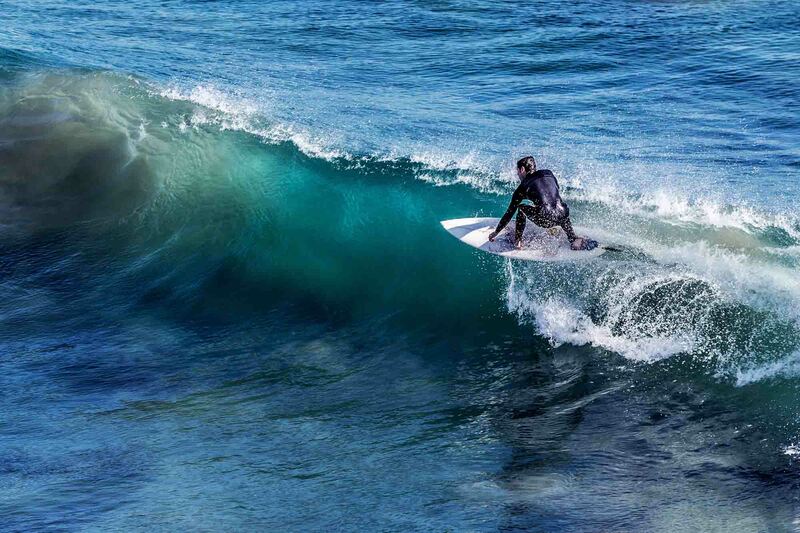 World Nomads – Popular with surfers as it covers sports like surfing. You also don’t need to begin the cover in your home country: if you forget to buy insurance before you get to Portugal, you can buy it there. If you’re from an EU or EEA country, remember to make sure that you have a valid EHIC card with you. The Algarve is a year-round surfing destination, so you can visit it anytime of the year – even in winter. In fact, spring, autumn, and winter are some of the best times to come to the Algarve to surf. The weather is still mild, it’s less busy, and both accommodation and surf school prices are often lower than in the summer. For more experienced surfers, winter also means bigger waves as well. Of course, summertime does mean better weather. It means that once you’re done surfing, you can spend time relaxing on the beach and working on that tan.